How was I notified of publication? By a mass email sent out to ARLIS members! This kinda took me off-guard. Since at my last look, my own article was covered in editing marks, I didn’t have a sense that things were in their final phase. I’m definitely more used to publishing online, where you can always withdraw or delete something if you change your mind. The permanence of print is kinda scary, especially if it’s your first scholarly work in a new field. Augh. I still haven’t read the finalized copy. Under the U Chicago Press publication agreement I signed, I am free to distribute copies of the printed article on my own website (for free and with full credit to the journal), to any classes I teach (not yet applicable in my case), and via institutional repositories to which I belong. This last one is interesting, because I work corporate right now and am no longer affiliated with any institution. Would I ask my alma mater to be my IR? I dunno, it’s a big commitment…. If you’re like me and not represented by an institution with an IR, you can try to find one! Some IRs allow total strangers to apply for membership. Not sure if “member” of an IR makes me “affiliated” with that IR for the purposes of the Publication Agreement I signed, but, if I get sued I’ll let you know. What’s nice about the U Chicago agreement is that I can reproduce the article in its entirety, in its final published format, which they emailed me shortly after the publication date. Some agreements only allow you to publish a pre-print version (usually with a big unsightly watermark across each page). You also can reprint your work anywhere else, at any time, with the proper credit to the U Chicago journal as first publication. The U Chicago Guidelines are here. In contrast, some other journals and publishers you might be signing with have taken far more draconian measures aimed at keeping your work behind a paywall. But, we all know it’s no match for Open Access. Print has a powerful allure, and Art Doc is a great journal. But scholarly research shouldn’t be behind a paywall, and I’d like to commit to only publishing my work in OA journals from here on out. As a first-timer, I think “anywhere that’ll accept me” is pretty fair, but make sure you read that publication agreement and make sure you have the right to offer a free copy somewhere else (and watch those embargo periods!). 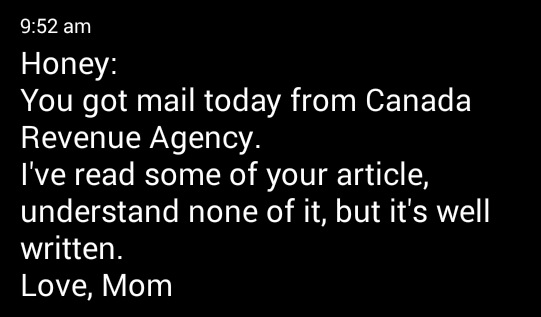 You’ll realize very quickly, when your mom says “Can I read that thing you wrote,” that being able to send her a link without a paywall or an embargo is pretty awesome. Relish the peer-review experience, especially on the reviewer side. It can teach you a lot, not just in the way of improving your own writing, but perhaps also of empathy. Keep it constructive. If you’re publishing on technology, current affairs / trends, or any topic that can change quickly, it might be best to enquire first about the length of the publication process. Turnover time matters, and if an OA journal can take you from submission to publication in 4 months, that might help your contribution to the field matter more. From first writing to final publication was 16 months, for me; the normal submission-to-publication for peer-reviewed work in Art Doc is about eight. The initial ego-boost is great! But do consider publishing only with journals that have an Open Access policy. Ideally, have your own portfolio or website to host the copy of your article that the press sends you (my email was started with “Professor Mayer,” which I admit made me feel amazing).